The Methodist Girls School (Secondary) Choir won 2 gold medals clinching first and second prizes (only two golds awarded in this category!) 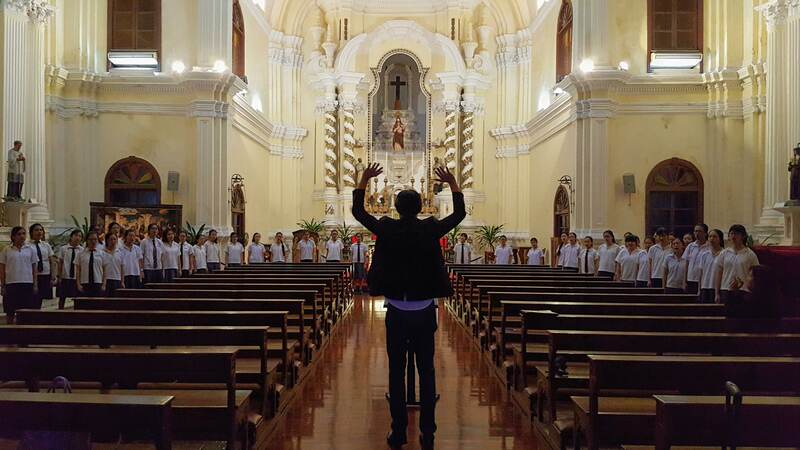 in the Youth (under 24) and Children’s (under 16) category at the IFCM World Choral Expo (WCE), an event by the International Federation for Choral Music (IFCM) together with various other organizations like the Macau Choral Art Association, China Chorus Association etc. Read more about the WCE here! As the organizer for the Asia Kodály Symposium, I can genuinely empathise with the logistical difficulties and challenges. There were confusion over transportation, as well as performance/competition venues and timings – Timely communication and having a go-to counter/person is crucial! 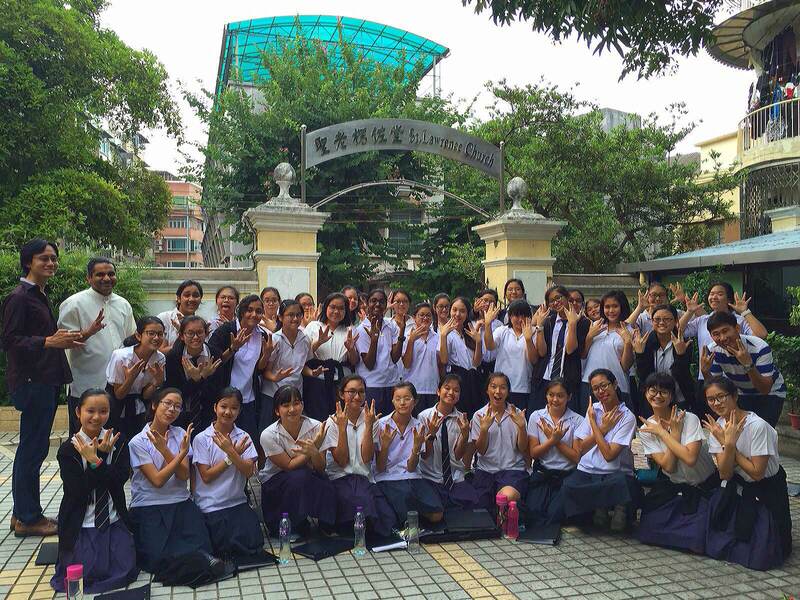 Despite the challenges, it is evident however, that the organizers have put in a lot of effort in securing the beautiful Macau University campus as the WCE main venue, as well as Broadway Theatre, historic and acoustically beautiful cathedrals and churches for its evening performances! Kudos to the team on the ground who soldiered on and got things done! Rehearsing al fresco at the University of Macau. Challenges aside, the competition is really just an excuse for the girls to be part of the WCE and get to hear and learn from some of the world’s finest choirs and conductors… where else would you get the world’s top choirs and a cappella groups congregating in one place!? I was impressed with the Salt Lake Vocal Artists (USA) (directed by Dr. Brady Allred) for their excellent and very artistic repertoire programming. The fantastic vocal delivery, impeccable intonation and musicianship shows a well-rehearsed and dedicated group of choral musicians who truly live up to their name! Formosa Singers (Taiwan) (福爾摩沙) directed by Julian Su (蘇慶俊老師) displayed an amazingly nuanced and clear delivery of text (especially evident in the dialect songs), not to mention ultra long legato lines (I am soooo envious!). I was really glad also to witness further, the energetic performances of the Asia Pacific Youth Choir (APYC) (my dear students between 18-28, you really should audition for this) under the direction of Stephen Leek, a choir whose founding was contributed by MGS’s own alumna, Cultural Medallion winner Ms. Jennifer Tham. I was privileged to be her representative at the historic IFCM Asia Pacific Choral Summit (Wuxi, China) in 2009 and witness the birth of the IFCM Asia Pacific Working Committee and the APYC! There were many other fantastic groups (Finnish group “Rajaton”, Netherlands group “The Junction” we love you!) although time is limited and we could only attend so many concerts whilst juggling our performance/competition responsibilities. 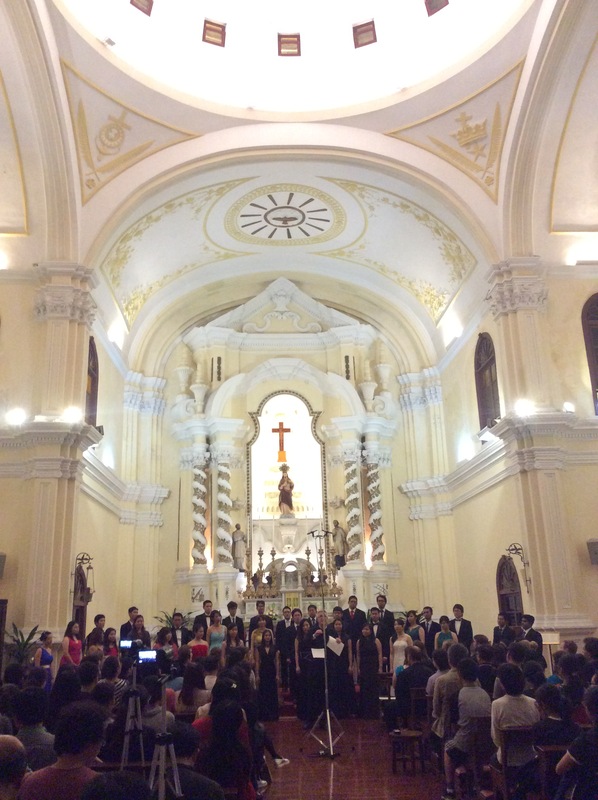 Asia Pacific Youth Choir singing in the beautiful St. Joseph Seminarium. 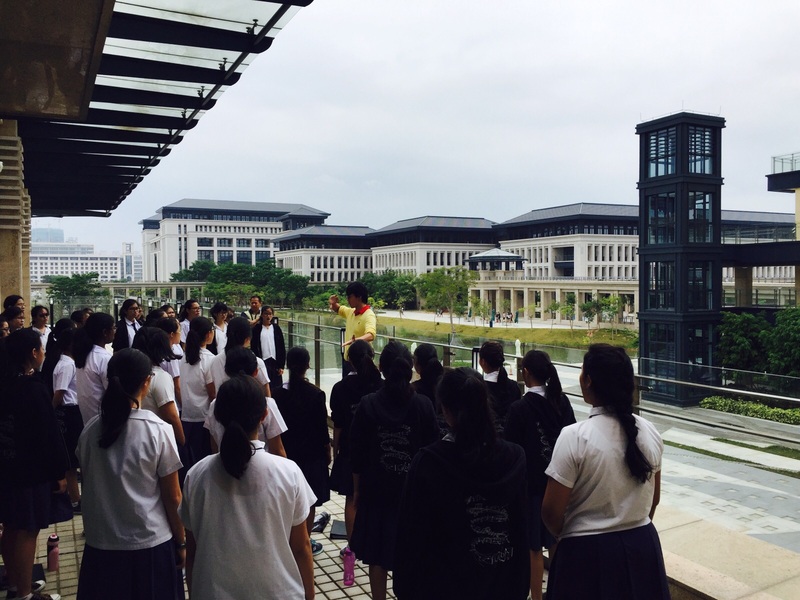 The MGS Choir got the chance to work with 2 renowned choral figures, Professor Andrea Angelini (Italy) and Professor Wu Ling Fen (China). There was an unexpected entourage seated at the back of the workshop classroom during the Chinese workshop, (people from Xi’an/Shaanxi?) who borrowed our students’ scores and snapped pictures of our commissioned music without permission before we could stop them… gosh… they did however come up to ask where they could purchase scores after… lol let’s see… Workshop with Professor Andrea was really fab – he was forthcoming with his feedback (such good ears!) and generous with his time. The choir really enjoyed the workshop! Shopping for this musician was in the form of buying wonderful choral music from publishers! I came with a half empty suitcase but return home with a full one after buying (and being gifted with) tons of scores from Edition Peters, Musica Baltica etc. Met with Linda again and got to know ex-Kings Singer Robin! 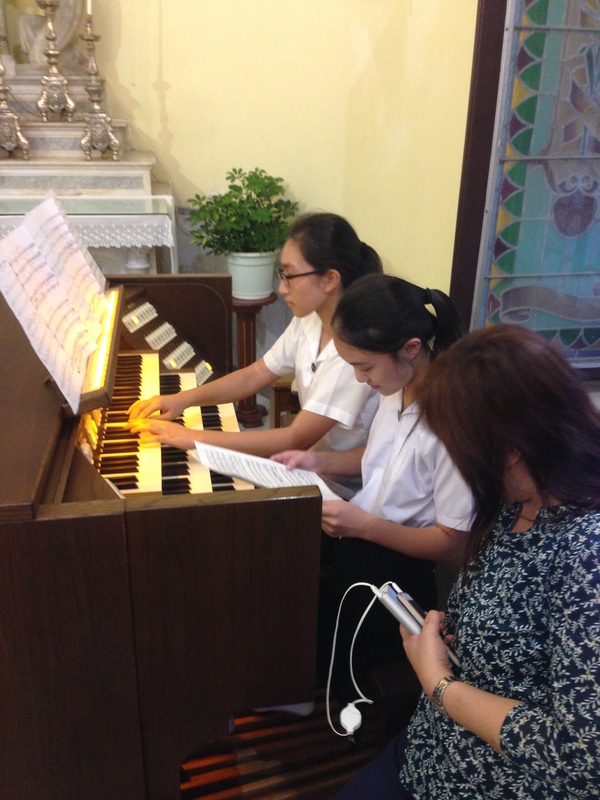 The highlight for the MGS Choir however, was probably getting to sing and perform in the St. Lawrence Church and St Joseph Seminarium (many thanks to teacher IC Mr. Dennis Auyang for going over and above his normal duties more than once, be it securing permission from the church and Father Jojo prior to arriving in Macau to various many other things). We shared the stage with a Baroque ensemble Sprezzatura at St. Lawrence Church and performed to an appreciative audience. We even made an impromptu performance singing Jingle Bell Rock (to Baroque tuning and Baroque instruments no less). It was really fantastic! With Father Jojo of St. Lawrence Church where we performed alongside Sprezzatura. Choir pianist Samantha working with Lee Ann on the church organ in St. Lawrence. We recorded ‘live’, some of our performances/rehearsals. Have a listen to the Soundcloud uploads here. It isn’t perfect as we were en route to peaking for the final performances at the WCE, but it is nonetheless a sincere offering from these ladies to the Macau (and French) audience. Despite that many of the choir members were falling sick or had injuries flare up resulting in a need for wheel-chairing, it has been a pretty good tour – The girls learnt important lessons e.g. being responsible not only for themselves but also to be accountable to the rest of the team, being PUNCTUAL and respecting timings, learning to be disciplined and remain calm in the face of stressful situations but most importantly, resilience and grit (it was a good 12-hour wait hanging around the campus between our first event and our performance at night).